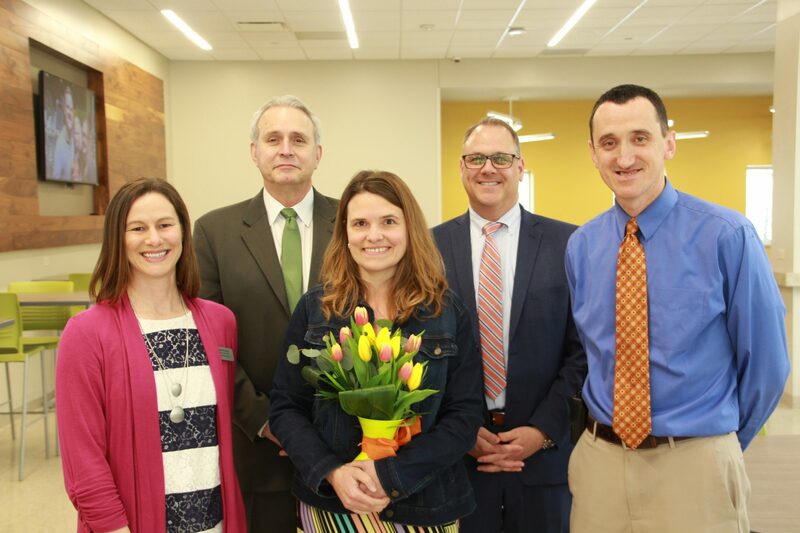 Lindbergh High School math teacher Laura Thomas is honored as Lindbergh Schools Teacher of the Year during a surprise announcement April 17. She is pictured here with, left to right, Board of Education Vice President Jennifer Miller, Superintendent Jim Simpson, Assistant Superintendent Brian McKenney and LHS Principal Eric Cochran. Lindbergh High School math teacher Laura Thomas was named the 2018 Teacher of the Year in Lindbergh Schools last week. Colleagues and family members honored Thomas during a surprise announcement at her school on April 17. As district Teacher of the Year, she will now be in the running for the Missouri Department of Elementary and Secondary Education Regional Teacher of the Year awards, which will be announced later this spring. Thomas teaches the high school’s most advanced math class, Calculus BC, in addition to Geometry College Prep, and College Algebra and Trigonometry. During her 17 years at LHS, Thomas has taught Algebra 1A, Algebra 1B, Algebra 1, Geometry College Prep, Algebra 2 College Prep, College Algebra, Pre-Calculus and Calculus BC. Outside of the classroom, Thomas serves as a graduation sponsor each year and also serves on the district’s Vertical Team for curriculum alignment across grade levels. In addition, she leads a learning community for math teachers and serves on the district’s Professional Development Committee. Recently, Thomas successfully completed a very competitive application process to become an AP Calculus exam reader. Very few teachers are accepted for this position, which is responsible for grading student AP exams from across the country during a week in the summer. This honor is just one example of Thomas’ passion for her content, sacrifice for her students and school and willingness to continue learning, the district said in the release. Thomas’ colleagues wrote in her nomination that she is a patient teacher who can find a connection with each student and help them understand math.